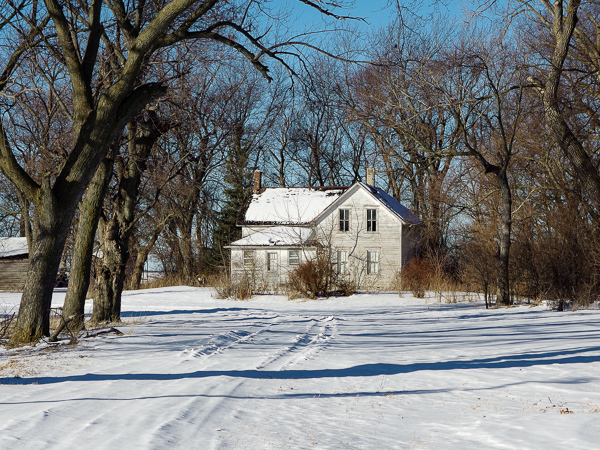 Farm houses like this one dot the midwest. They were economical to build and to add onto as the farm and family grew. This one is in Southwestern Minnesota. There is only one other building, a corn crib and the grove left to remember what went on here. At one time there were probably children that ran up and down the lane to catch the bus and I wonder how many times the words “race ya” or “last one to the house is a…” were excitedly shouted as soon as feet had left the bus and touched ground. People walked to the mailbox each day to see what news would come from friends and family. The mailbox was the social network of choice for folks further away than a few miles. They “liked” getting a good letter from a friend. This entry was posted in Uncategorized and tagged blue sky, copyright ryan ware, decay, family farm, farm house, farm life, farm site, fleeting farm, rural decay. Bookmark the permalink. You nailed back-in-the-day farm life with this post, Ryan. That house looks a lot like the one I grew up in with three different sections. Did you photograph the corn crib? I would love to see that image, too. It would take every ounce of energy to pull me back from wanting to walk up and try to get into this house. Looks like some tracks in the snow, maybe someone else had the same idea. Love this photo!